The Mazda 6 has always been a darling of car critics everywhere, yet for a multitude of reasons, it has never quite caught on with the masses. So Mazda has redoubled its efforts with the new 2014 Mazda 6, and the result is a more stylish-looking 6 that gets better fuel economy while still being roomy, practical and fun to drive. The new Mazda 6 has one of the more striking designs in the class, and to our eyes is an easy rival to the elegant Ford Fusion. Under the sleek skin there's a new 184-horsepower, 2.5-liter four-cylinder engine that provides spirited performance along with pleasantly subdued noises and an impressive 30 mpg combined fuel economy estimate. As a sign of these more fuel-efficient times, a V6 upgrade is no longer offered. Instead, Mazda will introduce a turbocharged 2.2-liter diesel four-cylinder later in the model year that should return at least 40 mpg highway while offering stronger acceleration than the base gasoline engine. What separates the 2014 Mazda 6 from most of the pack is its sporty, involving personality. But it's not the only midsize sedan vying for your attention, of course. The Nissan Altima is also one of the sportier entries in the class, while the Honda Accord offers an excellent all-around package. The aforementioned Fusion and the Kia Optima are also worth a look if sharp styling and creature comforts are high on your priority list. Nor should you ignore a perennial sales leader like the Toyota Camry. In short, there are many other outstanding choices in the family car segment, but if owning a classy midsize sedan that's also enjoyable to drive sounds appealing to you, the Mazda 6 is a great choice. The 2014 Mazda 6 is a five-passenger sedan offered in Sport, Touring and Grand Touring trim levels. Standard features on the base manual-transmission Sport include 17-inch alloy wheels, cloth upholstery, a tilt-and-telescoping steering wheel, air-conditioning, cruise control, full power accessories, a 60/40-split rear seat, a 3.5-inch multi-information display and a four-speaker sound system with a USB/iPod interface and an auxiliary audio jack. If equipped with the optional automatic transmission, the Sport also includes Bluetooth phone and audio connectivity, a 5.8-inch touchscreen, a rearview camera and audio upgrades (voice commands, HD radio, Pandora, text-message display function and automatic 911 notification). Stepping up to the Touring trim adds 19-inch alloy wheels, premium vinyl (leatherette) upholstery, dual-zone automatic climate control, a sliding console armrest and a six-way power driver seat. An optional Touring Technology package adds keyless ignition/entry, automatic headlights, rain-sensing wipers, auto-dimming rearview and driver-side mirrors, heated side mirrors, navigation, an upgraded 11-speaker Bose audio system and the Smart City collision mitigation system. The Grand Touring includes all of the above as well as unique wheels, a rear spoiler, adaptive/bi-xenon headlights, LED running lights, foglights, a power sunroof, leather upholstery, an eight-way power driver seat (with power lumbar support), a four-way power passenger seat, driver memory functions, heated front seats and satellite radio. Optional for the Grand Touring is adaptive cruise control bundled with a forward collision warning system. An Advance package (late availability) includes those optional features as well as lane-departure warning, automatic high beams and an energy capture system called i-Eloop ("intelligent energy loop") that can store energy during deceleration to a capacitor, which can then power air-conditioning, lighting and accessories for about a minute while the stop-start system shuts down the engine at a stoplight. 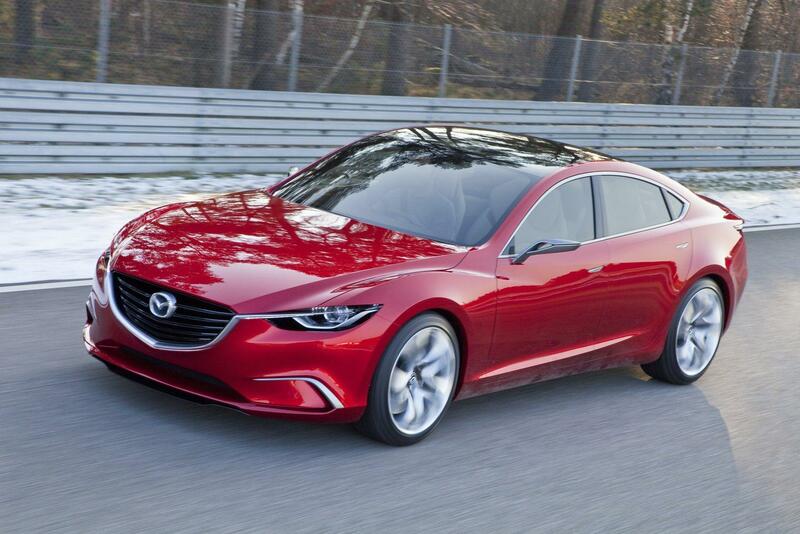 The 2014 Mazda 6 is powered by a 2.5-liter four-cylinder engine that makes 184 hp and 185 pound-feet of torque. It can be matched to either a six-speed manual or six-speed automatic transmission (with shift paddles on the steering wheel). The Grand Touring comes standard with the automatic. In Edmunds testing, an automatic-equipped Mazda 6 sprinted to 60 mph in 7.6 seconds, making it one of the quickest four-cylinders in its class. Fuel economy estimates stand at 26 mpg city/38 mpg highway and 30 mpg combined for the automatic, with the manual-transmission numbers rating 1 mpg less across the board. With the Grand Touring's optional i-Eloop feature, fuel economy rises to a very impressive 28/40/32. Standard safety features for the Mazda 6 include antilock disc brakes, traction and stability control, front-seat side airbags, full-length side curtain airbags and active front head restraints. The Touring and Grand Touring trims additionally include blind-spot and rear cross-traffic monitoring. The Grand Touring alone has Mazda's Smart City Brake Support, which is a collision-mitigation system that uses an infrared laser sensor at the top of the windshield to detect an imminent collision. It can automatically brake the car to a stop at low speeds if the driver doesn't react. A separate package (late availability) for the Grand Touring bundles a forward collision-warning system (that uses radar to detect your closing distance on vehicles ahead and then provides visual and audible alerts) with a lane-departure warning system. In Edmunds brake testing, a 6i Grand Touring came to a stop from 60 mph in 128 feet, which is a bit longer than average for the midsize sedan class. With plentiful rear legroom, the 6's rear passengers will feel as if they've been given access to a first-class cabin rather than coach. There's also generous headroom, even for those taller than 6 feet, though the sedan's sloping rear roof line makes the rear windows smaller, resulting in a more claustrophobic feel than you'd get in an Accord or a Camry. There's decent luggage space, as the efficiently shaped trunk offers 14.8 cubic feet of capacity. Inside, the Mazda 6 design aesthetic is clean and functional. Polished aluminum trim accents the cabin, while the Grand Touring's leather upholstery features contrasting stitching. Materials quality and fit and finish are among the best in the class. Most controls are simple and user-friendly, but the touchscreen interface found in most models is a step behind the systems in most competitors. The screen and the touch buttons on the interface are small, and we've found that it doesn't always get along with Apple products. On the upside, a multipurpose knob located south of the shifter grants a welcome level of control redundancy. One standout characteristic of the 2014 Mazda 6 is its powertrain. The base 2.5-liter four-cylinder gasoline engine is smooth and surprisingly hushed, and provides quick acceleration. And although many automatic transmissions in cars that boast high mpg numbers quickly upshift to the highest gear possible and are reluctant to downshift, the Mazda 6's automatic is responsive to gas pedal inputs and never feels flat-footed when you're initiating highway passing maneuvers. Furthermore, driving enthusiasts will appreciate the availability of a six-speed manual, which is fast becoming an endangered species in the midsize class. This same light-on-its-feet character carries through when the topic turns to handling. With its communicative, precise steering and sporty chassis tuning, the 2014 Mazda 6 feels sharp-witted and willing around corners, with stand-out dynamics for the class. The flip side, however, is that the 6 rides a bit more stiffly than competitors, especially with the 19-inch wheels. Like many Mazdas, the 6 is a car for practical-minded buyers with enthusiast leanings.